Kumi Yamashita, from New York, New York was selected to create the artwork. The piece was installed in April of 2009. Wandering through New Mexico and spotting fragments of ancient pottery scattered about, I would pause and wonder about the hands that had crafted these objects. Did they belong to an old woman or a young man? What was this person's day to day life like? And just who was this anonymous person who had lived and died leaving their mark on the land? 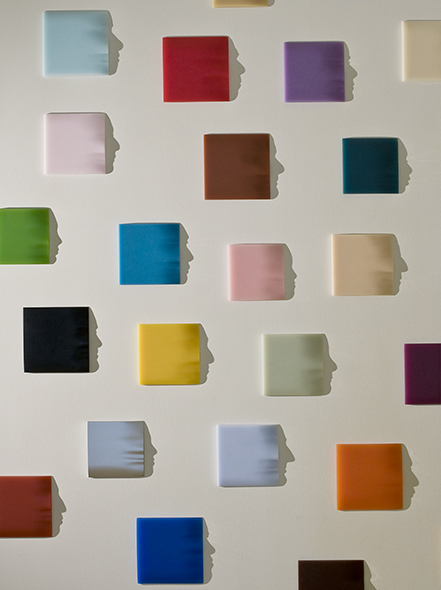 "Fragments" consists of 40 resin tiles which cast shadow profiles of 40 New Mexican residents of different backgrounds and ethnicities: Native Americans, Europeans, Hispanics, Asians, etc. These profiles are of people I met while traveling throughout New Mexico in 2008. Some have lived here all their lives, some have roots that go back countless generations, and others have recently made New Mexico their home. They are police officers taking a break over a cup of coffee in the middle of the night at a little diner in Carrizozo; a postal worker listening with so much patience and compassion to a homeless man talk about his life on the streets of Gallup; a family in Zuni Pueblo with a bread baking business in their backyard who offered me a loaf fresh out of the horno; a woman who runs a bar in Los Cerrillos and who, at the age of ninety, rejects any assistance from the customers to help her carry bottles of beer to the counter, while not forgetting to make those customers laugh with her charm and wit. They are bankers, construction workers, shop owners, cooks, clerks, students, guards, guides, artists, professors, librarians and children. "Fragments" is both a testament and celebration of the people whose names may never make it to the history books but who most definitely make up the rich fabric of life in a pueblo, city, county, and state. They are the anonymous who will leave their mark for future generations to pause and wonder.